Wat Burapharam is a royal grade temple that was established by the founder of Surin in the late 19th century. The centrally located meditation monastery houses Luang Phor Phra Chi, the most sacred Buddha image in Surin. Seated in the subduing Mara posture, the medium-size Buddha image sits in a majestic ordination hall sporting a slight European style thanks to crystal chandeliers hung from a white ceiling adorned with twinkling silver stars. Vividly painted murals depict key scenes from the Buddha’s life, including when Hindu god Brahma is said to have come to congratulate the Buddha after his meditative run to enlightenment. 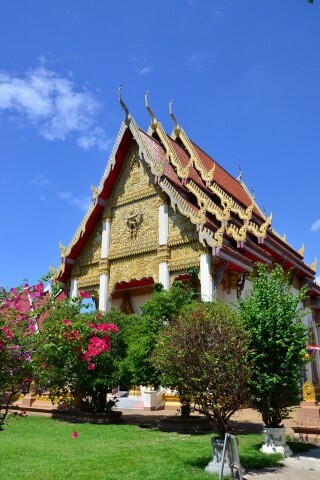 The temple was also home to the famous Thai Forest Tradition monk, Ajahn Dune Atulo, a Surin native who was visited here by the Thai king and queen during the late 1970s. An on-site shrine houses a life-like wax sculpture of the monk along with his ashes and personal effects. A neighbouring meditation hall is decorated with portraits of some two-dozen famous forest monks, including Ajahn Mun, Ajahn Chah and the American monk, Ajahn Sumedho. The meditation practices that Ajahn Dune taught are still central to daily life at Wat Burapharam. During our visit, several lay-people could be seen meditating or listening to Dharma talks on the grounds.